Hampton Manor is a stunning wedding venue with acres of beautiful grounds and a Michelin Starred restaurant that serves some of the best food I've ever tasted! Based in Hampton-In-Arden in Solihull, the Manor benefits from being right in the heart of the country with great transport links close by. For Helen and Jamie had their wedding and reception at Hampton Manor. They both got ready in the morning at separate locations and traveled to the Manor for the ceremony. Hampton Manor does have 15 rooms that are available for hire, one of which could be used for your bridal preparations if necessary. The wedding ceremony took place in The Birches, a lovely standalone building a minute's walk from the Manor. From there we moved to the terrace for a drinks reception, and used the expansive grounds to take some photos. 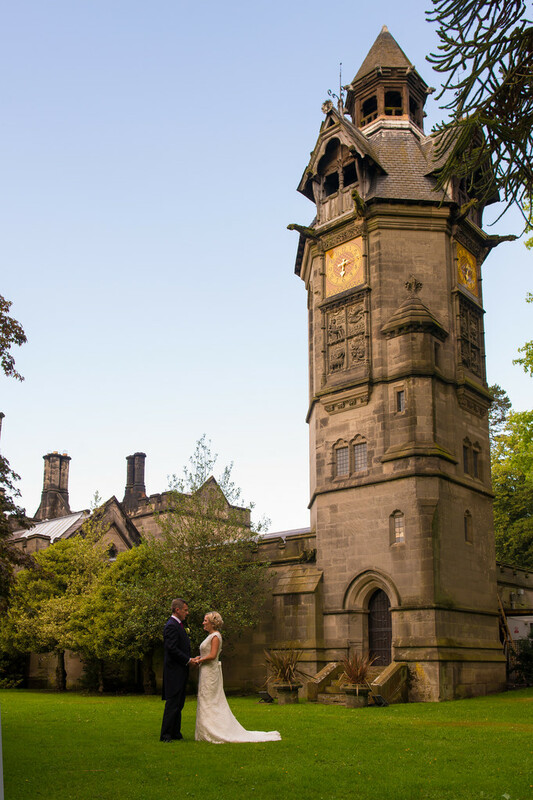 The wedding breakfast took place in the Courtyard, which isn't quite how it sounds: The Courtyard is the central space of Hampton Manor, right next to the Neo-Tudor Gothic clock tower. The Courtyard features a fully glazed roof and plenty of windows on all sides, spilling natural light into the area and giving the room a really airy feel. Despite the glorious conditions visible in the main photo, we had a brief but torrential downpoor in the late afternoon. The guests spirits weren't to be dampened however, and many stayed outside and took shelter underneath the large umbrellas. Location: Hampton Manor, Shadowbrook Lane, Hampton-In-Arden, B92 0EN.